Shannon Sea Launch | Shannon Boats. Boat Builder in Taree. See details on the Fission 500, Kayaks and Pulling Boats. 1/2″ Marine ply planking with epoxy glued, copper nailed and roved lands, will not “Open Up” when kept out of water, or trailered. Solid 2″ floor timbers throughout giving immense strength. 3/4″ Sacrificial docking keel sandwiching lead sheet. 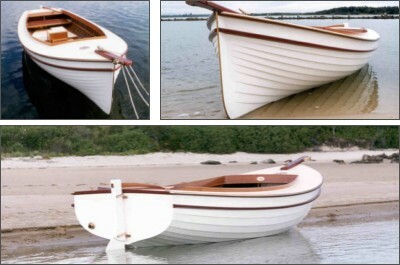 Hard wearing 2-pack polyurethane finish on hull exterior. 3/8″ Marine ply deck, glassed with hard wearing 2 pack polyurethane non-skid finish. Intergrain “Seamaster” Acrylic Varnish on hull interior, means “No Sanding” simply wash down for any future re-coating. All other brightwork traditional oil-based marine varnish. Seating for up to 7 people, with removable fwd and aft seats for ease of access. “Simac” all bronze double acting semi-rotary bilge pump. 23ltr. (5 gal.) stainless steel portable fuel tank with bayonet type connections for easy removal or simply fill through the bronze deck plate. All hardware, deck and otherwise solid bronze treated with “Glisten P.C” for nil tarnishing. Ribs and Stringers – Spotted Gum. Most other Timber Flooded Gum (Rose Gum). Fastenings – Copper and Silicon Bronze. Engines available on request include Simplex, Yanmar, Volvo, Bukh, Kubota, etc.